tax transcripts ordering concluded on Friday. On August 9, the Internal Revenue Service's eTranscripts for Banks Proof of Concept (POC) concluded its yearlong trial. That was the final day on which Send My Transcripts applications were available for use by the lenders, heathcare providers, and vendors who participated in the initiative. In written communication to NCS and other participants, the IRS commented that the program was an important step in exploring how Income Verification Express Service (IVES) vendors including NCS can improve online services for taxpayer consumers and help the IRS create more efficient online products. NCS has been involved with the initiative from its inception, and was responsible for attracting close to a dozen lenders to the program. Crucial to the project's success was Cecil Bowman, NCS' Senior Vice-President for Government/Industry. 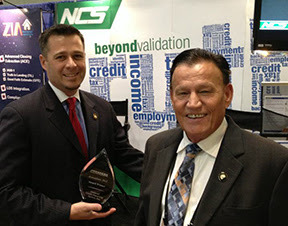 Bowman spent 35 years with the IRS before joining NCS in 2009. While at the agency his oversight responsibilities included developing the IVES protocols that NCS and other vendors use to interface with the IRS to obtain tax return transcripts on behalf of our clients. In July 2010, the Mortgage Bankers Association (MBA) asked Bowman to prepare their representatives for a meeting with the U.S. Treasury Department to advocate eTranscripts feasibility. The following January, he agreed to chair the MBA workgroup tackling IRS 4506-T issues. "According to the IRS," Bowman said, "the eTranscripts POC has been very productive because they learned a lot about creating a self-service application for consumer taxpayers. It was also the first time they were having taxpayer consumers actually go through a security e-Authentication process. Several thousand taxpayer consumers registered for online IRS accounts that they then used to communicate and interact with IRS tools and systems. It proved that people could register and establish a secure online account for self-service with the IRS." Bowman and the workgroup were also charged with devising an initiative to explore electronic signature viability for the IRS' 4506-T form. The eSignature program successfully completed its POC in 2012, and on January 7 of this year, the IRS began accepting eSigned 4506-T forms from IVES vendors including NCS. This acceptance of eSigned 4506-T forms meant conventional loan origination could now be completely electronic, giving consumers greater access, expedience, and security. (Get more information on how NCS' eSignature solutions can handle complete documentation for lenders as well as health care and insurance professionals). The messages from the IRS regarding the end of the eTranscripts POC stressed that this in no way impacts the eSignature acceptance program, which continues to gain users. "We can't forget that this was a proof of concept," said Bowman, "and we did prove the concept. Several thousand taxpayer consumers provided transcripts to their lenders, after establishing an account with the IRS and requesting confidential tax data be sent to a specific IVES vendor." NCS will continue to add its firsthand expertise to the ongoing efforts of the MBA's 4505-T Workgroup in helping the IRS improve the process for obtaining tax transcript data. We will pass along any news as it becomes available. Photo: Cecil Bowman, right, and NCS Executive Vice President Curt Knuth.